Papua New Guinea qualified for the 2010 Four Nations series with a 42-14 win over the Cook Islands in the Pacific Cup final in Port Moresby. The hosts dominated from the start to establish a 20-10 half-time lead. They raced away after the interval thanks to a hat-trick of tries from Gold Coast Titans youngster David Mead. Sheffield Eagles centre Menzie Yere also capped a tremendous tournament with two tries as a young Cook Islands team were outclassed by the Kumuls. 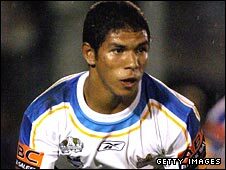 PNG will take the place of France in the Four Nations for 2010, lining up alongside Australia, New Zealand and England. Kumuls captain John Wilshere, the Salford full-back or winger, said: "This means so much to all our boys and everyone here in this country. "Rugby league is our national sport, we love it, and next year we're going to be playing in the Four Nations and that's a massive boost for Papua New Guinea." PNG coach Adrian Lam said: "I don't think it's really sunk in yet that we're in the Four Nations but we're excited about it and we'll get our heads around it soon enough."